Laura Kennington says she cannot ignore threats posted on social media. 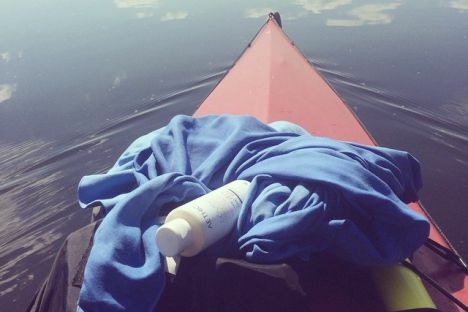 British sportswoman Laura Kennington, whose charity bid to kayak the entire length of the Volga from its source to the delta where it drains into the Caspian Sea, has pulled out fearing for her personal safety after an increasing number of "threats" were posted on social media sites. Kennington, whose exploits had gained her a huge following on Facebook and Russian sites, announced on her Facebook page Sunday, June 28, that the project, #‎CaspianChallenge, “has ended a little early”. She had planned to spend three months rowing a kayak the entire 2,300 miles length of Europe's longest river. Posted by Laura Kennington on 27 Июнь 2015 г. Writing on her project websiteKennington said she had been struggling for the past two weeks “to come to some sort of compromise about the situation I found myself in”. She mentioned “significant amount of messages (both sent directly to me and those we happened to see on Russian sites) [that] expressed very sinister intent and the attention didn’t ever back off”. The messages, she said, posed “a level of risk and vulnerability that is too high to justify”. Kennington, who had been rowing down the river for just over a month, had made it as far as Sveklino, a village in the Rzhev region, 300 km from Moscow. It was there that the 28 year-old sportswoman and personal trainer “made the incredibly tough, but ultimately right, decision to end the expedition and come home”. Comments posted to her Facebook page were largely supportive - from both foreign and Russian users. Many comments from Russians also express sympathy and regret she had to end her venture early. Her last message confirms that she had safely returned to the UK.